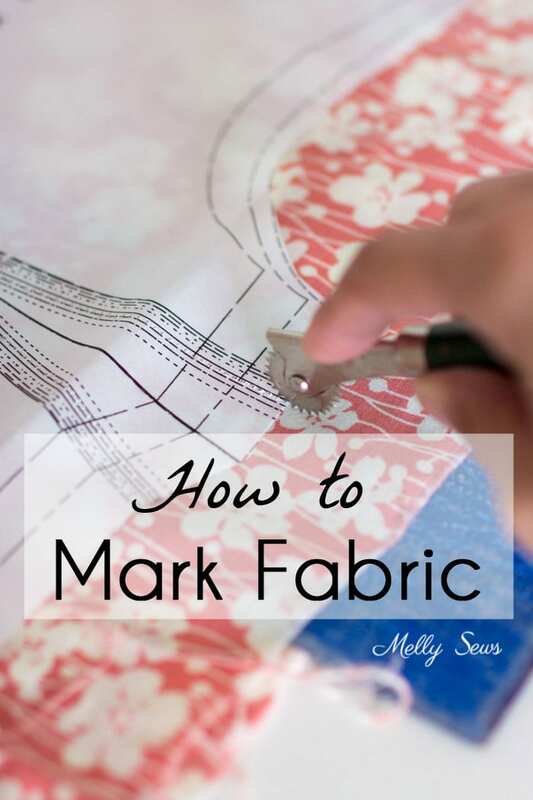 Hey y’all, today’s topic is a sewing beginner overview on how to mark fabric. There are a lot of tools that you can use to mark things like darts, pockets, notches, etc. Some of them are specifically designed for sewing, but some of my favorites actually aren’t. I’ve got a video below showing a variety of marking tools from my own studio. You can also watch it on YouTube here if you prefer. Let’s go over a couple of things I didn’t specifically mention in the video. 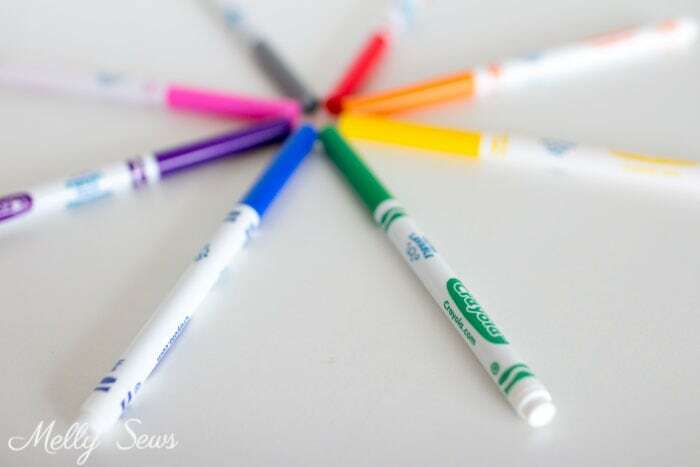 With the washable children’s markers, I prefer the fine line versions, and I choose the lightest color that will still show up on my fabric. Also, these are the best tool I’ve found for marking fleece, velour, and other fabrics that are fuzzy or piled. This is the chalk cartridge set that I use. I often use pins to push through the pattern at corners of pockets or dart points and then lift the pattern to mark a chalk dot at the pin points. Then I remove the pattern and connect my dots with a ruler for full markings. 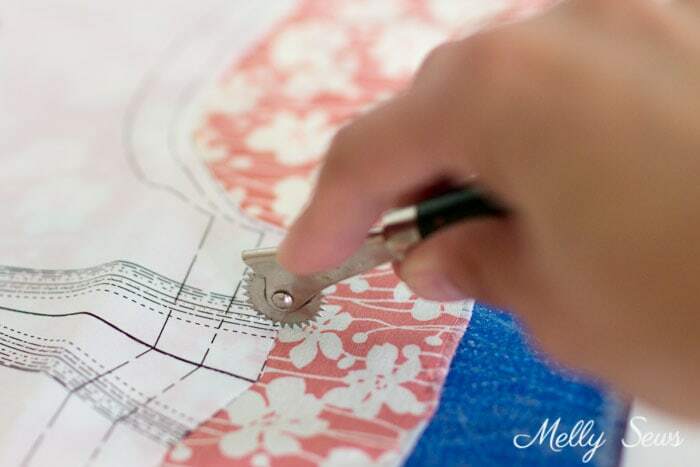 If you use the wax free tracing paper repeatedly on the same pattern, particularly if the pattern is printed on tissue, you may find your pattern falls apart at the markings. 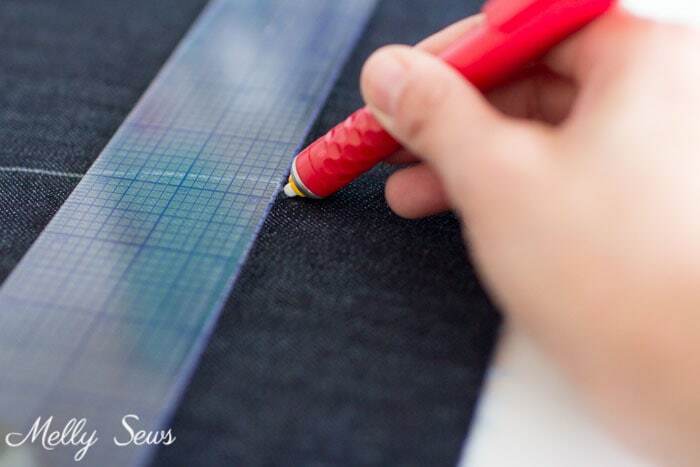 So when I plan to use a tracing wheel on patterns that I think I’ll use more than once, I like to reinforce marking lines with clear tape BEFORE tracing them onto fabric. Great tips. Thanks for those links to some marking products. I will definately try the chalk kit. My all time favorite-a sliver of soap. Dual benefit if it’s a fancy smelling one that perfumes the drawer you keep it in! Thanks for another GREAT video. I’ve sewn all my life, but always learn something from you! I thought I was all up-to-date because I’d bought Frixion pens. I had no idea they could shadow if fabric got cold. I can imagine some bust darts on light fabric looking quite odd on a cold winter day! Great ideas! My all time favorite from waaay long ago–and I still have it although the chalk is almost gone–is the Dritz (or Sorite) Tailor Tacker. It’s 2 little yellow plastic cylinders that each hold a small piece of chalk that has a hollow down the middle. One of the cylinders has a pin in it. You punch a little hole in the pattern on the spot you want to make–great for darts, etc–with the metal end of one piece–then stick the pin through your fabric, attaching the other end on the other side of the fabric, sliding it over the pin. Twist! Voila! Google it on Pinterest and you’ll see what I mean. Too bad they no longer make them ;( I think I will write Dritz right now! !